Menulog delivers for Two Brothers Mediterranean so you'll be able to track your courier on a map. Creamy sour yoghurt with olive oil. Creamy sour yoghurt, garlic and olive oil. Smooth grounded chickpeas, tahini sauce and olive oil. Hummus topped with diced meat. Hummus topped with traditional spicy sausage. White cheese aged baladi, herbs, tomato, capsicum and onion. Smoked eggplant, tahini sauce, olive oil and lemon. Vegetarian grape leaves stuffed with rice and herb mixture. Green beans, tomato, garlic, onion and mixed herbs. Minced raw lamb or beef mixed with fine bulgur and spices. Thinly sliced fried eggplant with lemon. Cubed potato with lemon, chilli and olive oil mixed in spicy seasoning. Fried stuffed pastry with meat and pine nuts. Fried stuffed pastry with feta. Fried stuffed pastry with spinach. Lamb Sambousek, Kibbeh and Cheese Sambousek. Crushed wheat, minced onions, pine nuts and minced lamb. A blend of fava beans and chickpeas mixed with coriander and special spices served with mixed kabbis and tahini sauce. Fried chicken wings served with coriander, garlic and lemon. Lebanese bread filled with kafta grilled to perfection. Traditional Lebanese sausages with lemon, pepper, salt and olive oil. Traditional spicy sausage, tomato, onion, capsicum and lemon juice. Char grilled traditional mixture of seasoned ground fresh lamb skewers (3 skewers). Served with garlic sauce and fries. 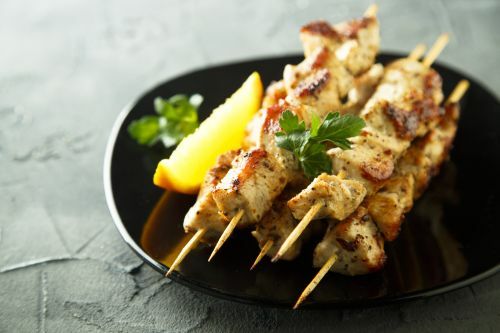 Char grilled marinated fresh chicken skewers (3 skewers). Served with garlic sauce and fries. Char grilled fresh lamb skewers (3 skewers). Served with garlic sauce and fries. Tabouli, Hummus, Baba Ghanoush, Tahini, Falafel, Fried Cauliflower, Vine Leaves and Kabbis. Char grilled combination of marinated fresh lamb, chicken and kafta skewers (3 skewers). Served with garlic sauces and fries. Char grilled combination of fresh Lamb, Chicken and Kafta Skewers (3 skewers), Tabouli, Hummus, Baba Ghanoush, Sambousek, Vine Leaves and Fries. Prawns, Squid, Fish Fillet, Calamari, Fries and Cocktail Sauce. Fried whitebait served with tahini sauce. Crumbed, fried salt and pepper squid. Garlic, tomato and red wine sauce. Garlic, lemon, olive oil and coriander. Chopped parsley with crushed wheat, tomato, onion, mint, lemon and olive oil. Rocket, onions, sumac, lemon and olive oil. Cos lettuce, pomegranate and sumac dressing, cucumber, tomato, spring onion, capsicum, radish, parsley and Lebanese bread croutons. Red coleslaw, prawns, octopus, calamari and olive oil. Sweet dessert pastry made of layers of filo pastry held together by sugar syrup. Contains nuts. Four pieces come in a serving.